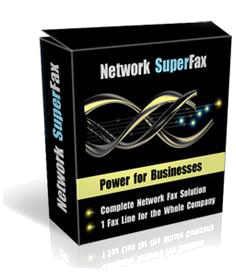 Network SuperFax 9.0 Easy to set up professional network fax software throughout an office or in multiple corporate locations. Receive & Forward faxes , receives faxes, forward faxes. Fax Broadcasts/Mailshots using CSV files. Built in PhoneBook with Import of contacts using CSV files. Sign a fax and E-mail it back without ever having to print it! All features available on the Fax server PC as well as the workstations. Check & send faxes even when away from the office using TCP/IP! Every user can log in on any workstation if required. When you log in, your personal send-log with up-to-date status of your faxes will be retrieved from wherever you are. Cover page editor to create your own custom cover pages and corporate logo! The client runs on Windows 98 and upwards including XP, Vista, and Windows 7. Supports multiple fax lines for larger or busier offices. The central server takes care of the scheduling, and can parallel process multiple faxes when broadcasting if more than 1 line is available. Network SuperFax server works with most fax modems supported by Windows XP or later, however we strongly recommend MultiTech range of Modems. E-Mail your fax! This way you can annotate, sign and datestamp a fax document, and return it by fax or just email. A Huge time saver! Supports High End Multi Page Scanners from HP Digital Sender Series 9000. You need to sign and fax back a multi page document or fill out a form. Whether received by email or fax you can do all this with the Viewer and our NEW signing features without having to print to paper! You have multiple sites around the country, connected via a WAN (Wide Area Network). Only 1 central outgoing fax server. Ideal for Real Estate Offices and Law Firms who need to sign documents and email them or fax them by return without first printing out!